We recommend to our mid-Michigan customers, sealcoating brings the most wow factor. Sealcoating parking lots and driveways can take a 20 something year old asphalt parking lot or driveway and make it appear new again. Just as some homeowners and grounds keepers prefer their grass to be a certain height, and some are fine with keeping grass trimmed just enough to keep the dandelions from taking over, how frequently sealcoating is done can be personal preference. When you work with a reputable asphalt maintenance company, parking lot and driveway sealcoating in Michigan can last between two to four years. However just as some companies prefer a perfectly manicured lawn each day, for perfectly black pavement, some may want to reseal every year. If the sealcoating is primarily for protection, 2-4 years is a standard range when a high quality sealcoating product is used. Just as paint seals wood from weather damage, sealcoating asphalt protects and seals your asphalt walkways, parking lots, tennis courts, basketball courts and residential driveways. Sealcoating parking lots and driveways seals small cracks and keeps them from developing into large cracks that allow water to seep down and compromise the integrity of the base material. Fresh applications of sealcoat on commercial parking lots and residential driveways increase the curb appeal by helping existing asphalt look new again. Asphalt sealing helps to fill surface voids in the asphalt which reduces exposure to oxygen, and UV rays. Sealcoating protects home driveways, garages, gas stations, and residential and commercial lots where chemicals are used. Diesel fuel, oil and gas, as well as salt and other chemicals can break the bond between the aggregate and the liquid asphalt. Asphalt sealant reduces the potential damage of chemicals penetrating deep into the asphalt. Sealcoating of asphalt pavement helps replace fine particles lost from the asphalt surface due to oxidation of older pavement installations. Applying sealcoating on pavement within a couple of years of laying it will protect the top layer from oxidation and erosion of asphalt particles. Sealcoating acts as a water barrier. Waterproofing asphalt prevents seepage of moisture from rain and snow which prevents damage caused by freeze and thaw cycles common in our Michigan climate. These freeze and thaw cycles are the cause of all those lovely potholes and alligator cracks we steer our way clear of on the streets and parking lots of Lansing, Okemos and throughout mid-Michigan area! Along with the attractive black surface sealcoating leaves a smooth, clean surface that is easy to clean up and sweep, reducing property maintenance time and clean up. Sealcoating’s smooth surface also makes it ideal for painting lines and markers in parking lots and athletic courts. Sealcoating’s rich black color attracts the sun which helps to keep the asphalt more pliable during Michigan’s warm months. Pliable asphalt reduces the creation of cracks even in high traffic areas. 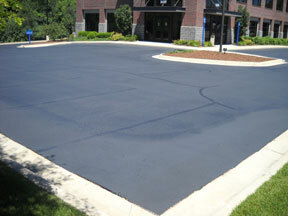 Sealcoating parking lots and driveways in Michigan regularly helps reduce maintenance costs. How much does sealcoating parking lots and driveways cost? When you consider what you save from having to repave regularly, the cost of sealcoating a driveway or parking lot is pennies compared to resurfacing or repaving a parking lot or drive that has not been maintained in Michigan’s climate. The cost of sealcoating parking lots and driveways is based on a per square foot fee as well as the quality of sealcoat material used. Door to door sealcoating contractors are usually not as affordable as Eric Rogers. Because Eric Rogers’ sealcoating mix is superior to most pre-packaged products on the market, many local asphalt maintenance and sealcoating companies, large and small, purchase our sealcoating products for their customer asphalt maintenance projects. Once you’re seasonal lawn maintenance is covered, take a walk around your home or building. Note any asphalt patching or repairs that need to be made and then give us a call. Eric Rogers is located in Charlotte, Michigan but we serve many satisfied customers throughout the Michigan lower peninsula with our primary focus in and around Lansing, Grand Rapids, Ionia, Battle Creek, Novi, Okemos and East Lansing. We sealcoat residential driveways and large manufacturing plant parking lots, retail parking lots and medium to small commercial parking lots, no job is too large or too small. Contact us today and we will schedule an on-site consultation. If asphalt patching, hot rubber crack filling or basin repair needs done prior to sealcoating we will provide a complete cost estimate for all services and time frame for completion. Sealcoating parking lots and driveways in Michigan takes the weather faded gray, rough and gravely driveway or parking lot and turns it into a smooth bright black surface that looks brand new and extends the life of your pavement.